"This cake starts with a white cake mix and ends up with four layers with a yummy coconut filling." Prepare cake mix as per package directions for a two layer cake. Once cake is cool split layers with a thread to create four layers. 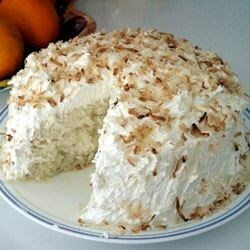 Mix together sour cream, sugar and all but a portion of the coconut (some should be reserved for top). Set aside one cup of this mixture. Spread remainder between layers of cake. Combine whipped topping and the reserved sour cream mixture. Use this to ice the cake. Toast remaining coconut and sprinkle on iced cake. Store in the refrigerator for three days before cutting. The longer it is refrigerated, the better it is! Oh, besides my last review raving about this cake, I forgot to mention that I did use confectioner's sugar and only 1 cup of it sufficed!!! happy baking!